It’s a particularly grim weekend in early January 2014. Let’s escape briefly, into 1930s York, via the ads in these old theatre programmes I picked up in the Barbican Bookshop sale. Betty’s had only recently opened in St Helen’s Square. 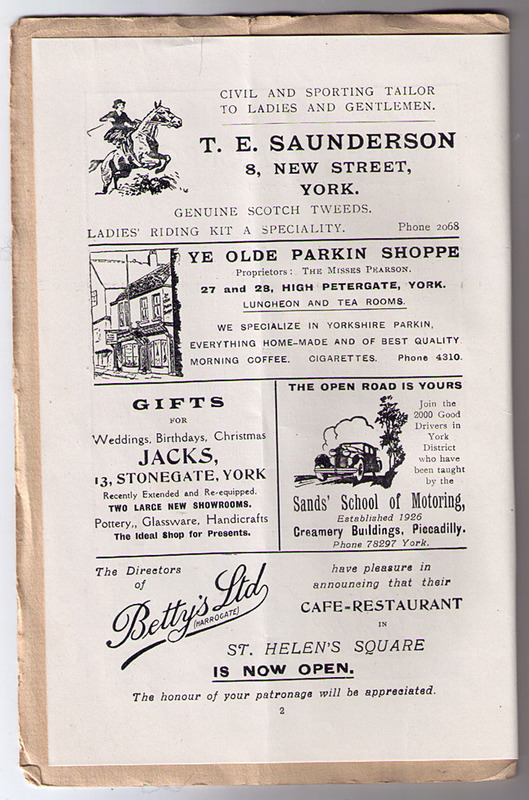 And before I get complaints that there shouldn’t be an apostrophe in the Bettys name, there was one in the 1930s, as is clear in this advert. Back then, when it was just starting up, its adverts ended with the quaint and humble sentence: ‘The honour of your patronage will be appreciated.” These days they wouldn’t need to ask: there’s often a queue right out of the door and round the corner. If you didn’t fancy that – refreshments, and cigarettes, were also available at ‘Ye Olde Parkin Shoppe’ on High Petergate. Back in 1938 a motoring school in the ‘Creamery Buildings’ somewhere on Piccadilly could help you get out onto those ‘open roads’, when they really were open and not clogged up with loads of other traffic. 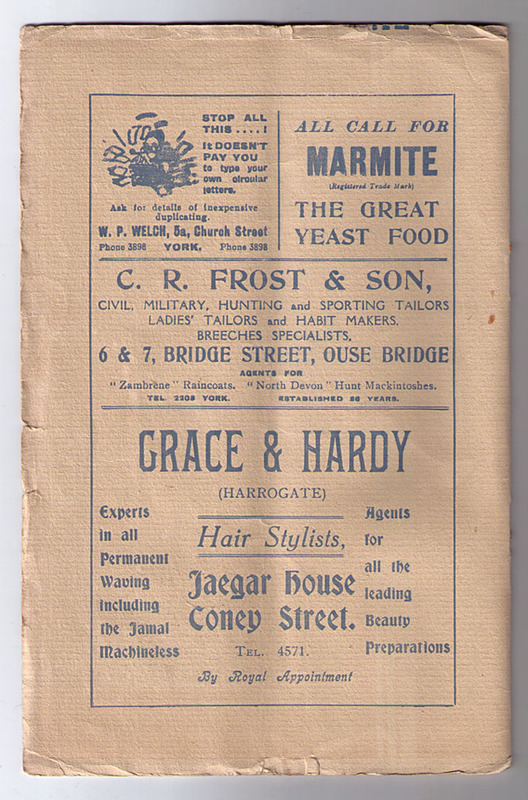 Shouty adverts told readers to stop typing their own circular letters, and to call for Marmite instead. If you were in need of breeches you could find them on Bridge Street, then pop along Coney Street for a ‘Jamal Machineless’ perm. 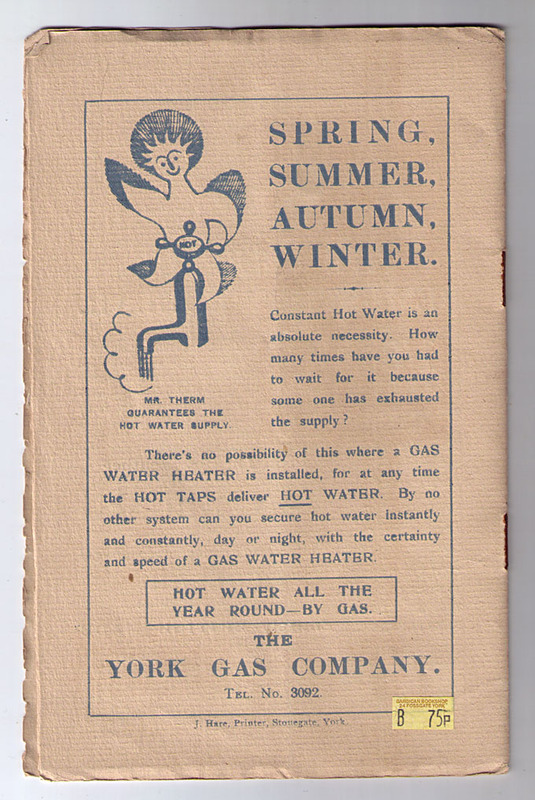 ‘Constant Hot Water is an absolute necessity’ in 1937. I wonder how many homes had one of these gas water heaters. Perhaps not many, as the idea of having a hot water tap actually deliver hot water is emphasised, apparently quite exciting. By Lisa @YorkStories • 5 January 2014 Miscellany To link to this page's proper location please use the > permalink. “Gas water heaters”1930’s Milner St Acomb,usually sited over the back kitchen sink,a white enamelled tube,2 feet long x about 1 foot Dia,connected to gas and water mains.Switch on /gas burner lights delivering instanty warmed water via a small dia. Worcester doing a grand job in our house today. Very handy in getting a bath in a “Bathless”house. position next to sink,swing over hot water pipe,run as long as required to fill tub,and”Voila” one lovely hot tub to bathe in. That was my ladies life growing up ,keeping clean as a whistle in tough times!Those gadgets were well before their time.